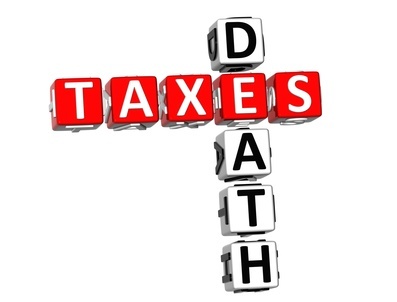 As the saying goes, the two unavoidable things in life are death and taxes. Wills and estate laws have the peculiar distinction of involving both at the same time. When a person dies, his or her estate gets taxed. So, even in death, taxes can’t be avoided. There is a process in place to deal with a person’s estate upon death. In Ontario, an estate trustee is used to manage and distribute the estate’s assets. If the deceased has a will, then a certificate of appointment of estate trustee with a will needs to be obtained. If there is no will, then a certificate of appointment of estate trustee without a will might be required. Such certificates aren’t always mandatory. Advice from a qualified wills and estates attorney should always be obtained to ensure all proper procedures are followed. An estate administration tax (EAT) is paid on every obtained certificate of appointment of estate trustee. In addition, as of January 1, 2015, an Estate Information Return must also be filed 90 days after the issuing of the certificate. This is not unlike filing an income tax return upon the paying of one’s taxes, which is why the measure has its critics. The Estate Information Return essentially allows the Ontario provincial government to determine if the correct amount of EAT has been assessed and will be paid, similar to the government’s ability to assess or audit how much income tax one should be paying. The potential problem, however, is that this new system may cost taxpayers a substantial amount more to administer without there being any accompanying benefit. These returns will have to be filed, and will have to be processed, but there is no guarantee that additional revenues will be collected. So, if taxes and bureaucracy weren’t enough during life, they still might bite afterwards. Again, a qualified wills and estates attorney can guide you through all of it.